Cleveland Area History: What was that street named? In 1905, the City of Cleveland renamed many of the north-south streets as numbered streets. At the same time, they also renumbered the houses. A while back, I mentioned Old and New Street Numbers an incredibly useful publication that lists the old street name, the new street name, the old house number, and the corresponding new house number. Knowing the old address of a property can be quite useful in locating information about it in historic newspaper databases or other documents. The problem lies in figuring out what the previous name for a given street was. To that end, the Street and Avenue Guide from the 1906 City Directory is quite useful. It lists, in alphabetical order, the old and new names for the streets. The only downside is that it only lists the old street name as of the beginning of the 20th century - one must consult other sources to determine the more historic street names. This transcription at rootsweb is a bit easier to search, although there can be some mistranscriptions so the source you cite is useful as well. There's also a good source for the original addresses at CPL. 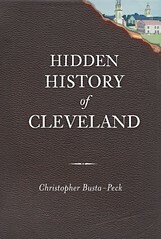 The Encyclopedia of Cleveland History also has a list of the name changes. I wish our soon-to-be street was previously named; Duane Street sounds much better than a number! Question: was Kennard Street (East 46th) named after the family who established the Kennard House restaurant?